Coleco B.C. 's Quest for Tires in 01:40.45 by MESHUGGAH. B.C. 's Quest for Tires is a 1983 video game developed by Sydney Development and published by Sierra On-Line. It was released for not just the ColecoVision, but also the Commodore 64, Atari 8-bit family, ZX Spectrum, MSX, and Apple II. The game is based on the comic strip B.C. by Johnny Hart, with the title being a play on the title of the contemporaneous film Quest for Fire. 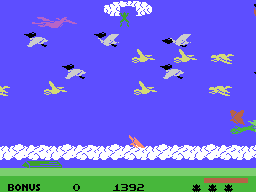 In the game, the player takes the role of the caveman Thor, who has to rescue his girlfriend, "Cute Chick", who has been kidnapped by a dinosaur. 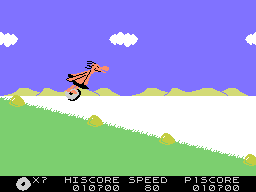 To do this, he must travel on his stone unicycle (actually an impossible wheel) through several levels. Each level has Thor moving from the left to the right, avoiding various dangers. The game is considered ridiculously difficult, but MESHUGGAH beats one loop of the game in just 1 minute and 40 seconds, making it look easy. Coleco Donkey Kong (unknown) in 00:44.19 by Fortranm. 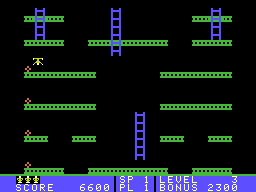 Donkey Kong is a classic arcade game that spawned many ports, including this ColecoVision port. Coleco Dragonfire (unknown) in 01:40.6 by Mothrayas. The king's treasures have been stolen! As the daring young prince, your goal is to recover them all. 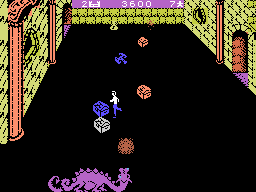 Dragonfire is a 1982 video game published by Imagic, developed for Atari 2600, Intellivision, Commodore 64, Apple II, ZX Spectrum, ColecoVision, and more. The objective of the game is for the player to run over a castle drawbridge while avoiding fireballs and other obstacles, and then grab treasures guarded by a dragon who spits more fireballs at the player. Leave the room, rinse and repeat until lives run out. Other obstacles include a moving drawbridge, an archer firing arrows at the player, and a troll inhabiting the treasure room. Coleco Frogger II: ThreeeDeep! (USA) in 11:50.38 by CoolKirby. In this game, you must move the frog to each berth at the top of the screen. There are three different types of areas. The author completes the first 5 levels, after which there is no new content. Coleco Jumpman Junior (USA) in 04:40.42 by BrunoVisnadi. Jumpman Junior is a game developed by Randy Glover, who described it as a "lite" version of Jumpman containing 12 levels for users without disk drives. In it, you need to defuse all of the bombs placed on Jupiter by terrorists. To do this, you must climb up ladders, touch the vines, and, of course, jump. BrunoVisnadi improves the previous run by 7.70 seconds, thanks to a new trick and faster routes. Note: The character should not be confused with Mario, who was originally named Jumpman. 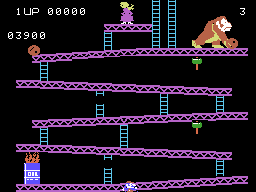 Interestingly enough, Glover cited Donkey Kong as inspiration for this game. It is not known whether the naming is a coincidence or not. Coleco Miner 2049er (unknown) in 07:36.61 by nymx. 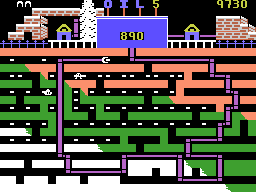 Miner 2049er is a platform video game created by Bill Hogue that was released in 1982 by Big Five Software. The title "Miner 2049er" evokes a 21st-century take on the California Gold Rush of around 1849, in which the gold miners and prospectors were nicknamed "49ers". As Bounty Bob, the player's goal is to inspect every section of each mine in search of the evil Yukon Yohan while avoiding the radioactive creatures that inhabit the mine. As Bounty Bob walks over a section of flooring, it fills with color. To complete the level, every section of flooring must be colored. nymx walks over every section of flooring in record time. Coleco Oil's Well (USA) in 03:27.64 by BrunoVisnadi. In Oil's Well, you control a robotic arm with a drill head as it mines deep below the earth's crust to mine oil and make you rich. But two kinds of enemies lie in wait for you – bugs that damage your robotic arm, and land mines that damage your drill head. You must coordinate your movements to avoid them or your drill is toast! This run by BrunoVisnadi completes all 10 stages in under three and a half minutes with carefully planned routes and some close calls with enemies. Coleco Smurf: Rescue in Gargamel's Castle in 02:06.35 by EZGames69 & Mothrayas. Smurf: Rescue in Gargamel's Castle is a 1982 video game published and developed by Coleco for the ColecoVision and Atari 2600. The game is based on the television series The Smurfs. 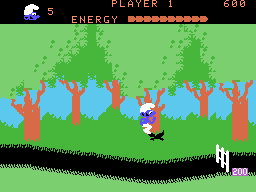 In the game, the player must brave a series of obstacles to rescue Smurfette from Gargamel's castle. EZGames69 and Mothrayas rescued Smurfette in record time. Coleco Zaxxon (USA) in 01:55.89 by dwangoAC. 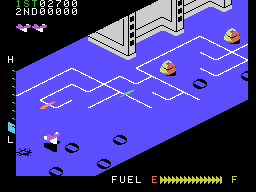 The original arcade game Zaxxon was the first game to employ an isometric perspective, later used in other games like Q*Bert, Marble Madness, and Fallout. This ColecoVision port preserves the graphical style which gave the game its name – AXONometric projection. This run by dwangoAC uses the hardest difficulty and performs several difficult shots in order to beat the first cycle of the game in under two minutes.